I’m watching Space Patrol Luluco. I know it’s going to be good because it has Inferno Cop in it. I’ve been re-watching young justice since there is now a chance Netflix will order a third season. I’m just now noticing all the references to Hello Megan in season one. I also just noticed the changed Hawkgirl’s name to Hawkwoman. I approve. Possible new Digimon series leaked, titled: Digimon Universe Applimonsters. Original Voice Actress for Digimon’s Sora, Yuko Mizutani Has Died. Recently she had voiced Ikuko Tsukino Usagi’s mother in Sailor Moon Crystal. She was 51. I just learned Alan Young, the voice of Scrooge McDuck for the past 30 or so years died. And unless he recorded more lines for anything else, this was the last thing he did. I don’t know why companies do this. 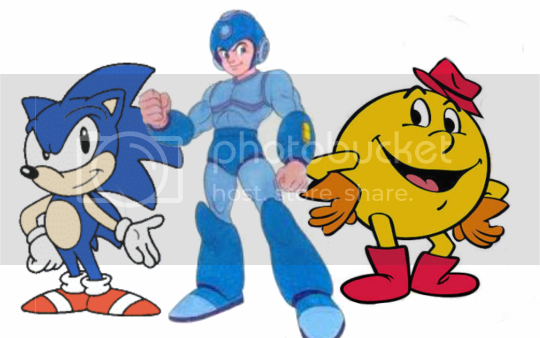 Its kind of sad Nintendo could do them justice in Smash Bros but their original creators can’t. 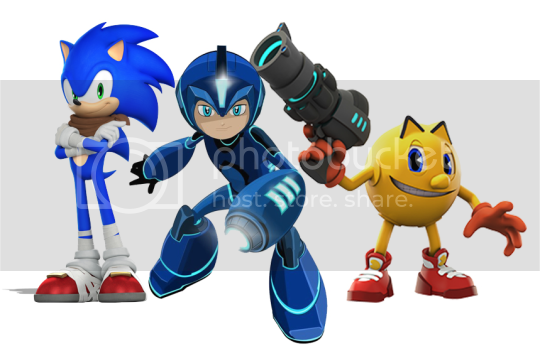 Sonic Boom is just a spin-off, so we still pretty much have the “old” Sonic. Still a shame what happened to the other two though. Why Namco? Why did you turn Pac-Man into a Naruto clone? I saw Zootopia a few hours ago now. Right after it ended I thought it was clever and fun, but it didn’t leave much of an emotional impact. Basically the opposite of Big Hero 6. While that is still mostly true it is dawning on me just how much more clever it is then Big Hero 6 or Frozen. The third act sidesteps stumbling over a fake heroic sacrifice, or boring villain the way many Disney movies do. The fake heroic sacrifice is used to con the villain and just the villain, so when it is revealed that Nick was faking going savage it doesn’t feel cheap. To the contrary, it pays off the set-up of Judy and Nick trying out hustle each other by showing them work together to hustle the villain. Second, Assistant Mayor Bellweather motives for being the villain make sense in a relate-able way. On top of that, when she is outed as the villain she has shown herself to be a competent threat to the heroes. What amazes me is how well it handles such sensitive subject matter. First Zootopia shows an understanding that there is a time and place for race jokes. It shows that the most damaging racism can be entirely unintentional. Most impressive, is that the movie points out that there is no easy solution and change will neither be quick or easy if it’s possible at all. I also watched The Boy and the Beast, but I’ll get into that another time. I was pleasantly surprised to find that Funimation has licensed and released The Girl who Leapt through Time on Blu-ray. I finished Ouran Host Club. [quote=“sixsicksixes”]I finished Ouran Host Club. Awesome! Glad you enjoyed it. Bones really outdid themselves with the adaptation. Finding it very hard not to say “well, duh!” right now. Anybody seem The 7 Deadly Sins? A friend told me to watch. I’ve watched the first 2 Episodes so far. Not what I expected at all. And someone highly recommended SUPER HERO ACADEMIA. Then I did have ENOUGH on my list, but I think I just mistyped ANOTHER maybe. Unless there is an Anime called ENOUGH. But anyone seen any of these? YOUR LIE IN APRIL was Recommended aso well but it looks terribly mundane so probably skipping that one. I read each Episode’s synopsis so…I feel I know what happens. Seven Deadly Sins was a fun viewing. I’d watch more if it was available. Oh no, was it cut short like Deadman Wonderland? Um, my memory is pretty awful with stuff like that. The story arc wraps up pretty well, but there’s a lot of potential content and story beyond the series, so if they want to produce more, the space is there. [quote=“Giggler”]Anybody seem The 7 Deadly Sins? 7 Deadly Sins is pretty cool you are going to have to give it some episodes and I’m pretty sure it doesn’t finish. DEATH PARADE is good the pyschological aspects were nice. ANOTHER I feel is the weakest on the list. HERO ACADEMIA is great but it doesn’t really start getting interesting till episode 4. Also this won’t finish there will probably be more seasons later. Yeah, I heard Super Hero Academia literally just started and is like the next big thing. Well its one of the better anime for spring. So far its listed for only 13 episodes so I’m guessing it will get more seasons later. These are the things I’d argue are biggest new series for spring.